This week we welcomed Ella from Parmiters School into our design team on a work experience placement. 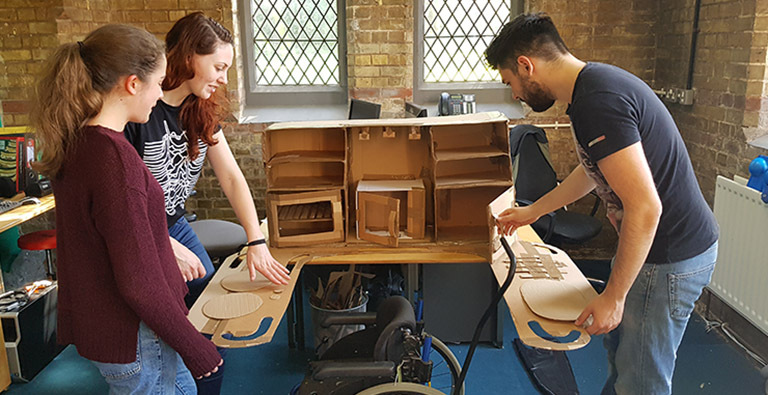 Students joining us on work experience get first hand insight into our design process from research to prototyping and manufacturing products that help people overcome barriers to inclusion and independence. Ella got stuck in with our Big Little Car project, helped to manufacture our next batch of Sensory Shell Chairs for children with sensory processing disorder, practiced CAD and 3D printing and made a full-scale mock-up of a wheelchair accessible play kitchen we’re designing to give a 7 year old with cerebral palsy a great experience of independent play. Together we were able to test the position of the play emements and check the width and height will be exactly right for use while seated in a wheelchair. Thanks for joining us Ella!